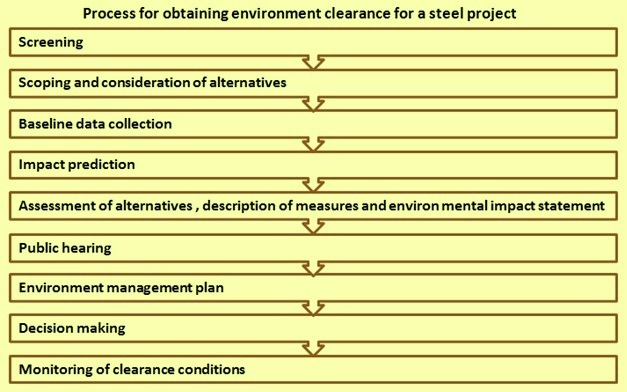 The environment clearance (EC) process for a steel project (Fig 1) has the following built in steps. These steps are (i) screening, (ii) scoping and consideration of alternatives, (iii) baseline data collection, (iv) impact prediction, (v) assessment of alternatives, description of mitigation measures and environmental impact statement, (vi) public hearing, (vii) environment management plan, (viii) decision making, (ix) monitoring of the clearance conditions. The environmental impact assessment (EIA) and environmental management plan (EMP) is part of EC process. EIA and EMP is normally necessary for obtaining EC for (i) those projects which can significantly alter the landscape, land use pattern and lead to concentration of working and service population, (ii) those projects which need upstream development activity like assured supply of mineral products supply or downstream industrial process development, (iii) those projects which involve manufacture, handling and use of hazardous materials, and (iv) those projects which are located near ecologically sensitive areas, urban centres, hill resorts, and places of scientific and religious importance. For obtaining EC for the steel project, it is essential that a report covering the EIA and EMP) is submitted to the regulatory authorities. This report assists the process of decision making with regards to the EC for the project. In addition to getting EC for the project, the purpose of the EIA and EMP report is to take into account the environmental aspects of the project not only during its implementation but also after its commissioning. The purpose of EIA is to identify and evaluate the potential impacts (beneficial and adverse) of the steel project on the environmental system. It is a useful tool for decision making based on understanding of the environmental implications including social, cultural and aesthetic concerns which can be integrated with the analysis of the project costs and benefits. EMP is required for the formulation, implementation and monitoring of environmental protection measures during and after commissioning of steel project. EMP is required to indicate the details of the various measures already incorporated in the project or are proposed to be taken including cost components. Cost of measures for environmental safeguards is to be treated as an integral component of the project cost. The exercise of carrying out the EIA and EMP for the steel project is undertaken early enough in the planning stage of the steel project since it helps in the selection of environmentally compatible site, processes and technologies, and provides other environmental safeguards during the project development. EIA and EMP is normally considered a planning tool which is usually accepted as an integral component of sound decision making. It provides the environment its due place in the decision-making process by clearly evaluating the environmental consequences of the proposed steel project before start of its implementation. Early identification and characterization of critical environmental impacts allow the regulatory authorities and the public to be aware of the environmental acceptability of a proposed steel project and the actions which are planned to be taken by the project authorities to mitigate or to reduce the risks and the impacts. The EIA and EMP report normally covers in a systematic way all the issues such as regulatory requirements, the EIA methodology including baseline studies, identification of key issues and consideration of alternatives, impact analysis and remedial measures. It also describes the process of reviewing the adequacy of EIA and EMP issues as well as their monitoring after the plant commissioning. The EIA part of the report is prepared on the basis of the existing background pollution levels vis-a-vis contributions of pollutants from the proposed steel project after its commissioning. The EIA normally addresses some of the basic factors such as (i) meteorology, (ii) air quality, (iii) ambient levels of pollutants such as sulphur dioxide (SO2), oxides of nitrogen (NOx), carbon monoxide (CO), and suspended particulate matters (SPM), (iv) hydrology and water quality at the project location and its surroundings, (v) occupational health and safety (O&HS), (vi) transportation of raw materials and details of material handling, and (vii) control equipment and measures proposed to be adopted for environmental control. Ambient levels of pollutants are determined at the centre and at three other locations on a radius of 10 km with 120 degrees angle between the locations. In the EIA report, it is necessary to predict additional contribution of pollutants at the locations under different meteorological conditions prevailing in the area after taking into account the emission rates of the pollutants from the stacks of the proposed steel project after its commissioning. As regards hydrology and water quality at project location, it is essential to describe the details of the treatment and disposal of liquid effluents and solid wastes as well as the methods of their alternative uses. For the EMP part of the report the requirement is the formulation, implementation and monitoring of the measures for environmental protection during and after commissioning of the steel project. The objective of EIA is to foresee the potential environmental problems which arise out of the proposed steel project and address them during the planning, design and engineering of the steel project. The EIA process facilitates the flow of information to (i) the project authorities, (ii) the regulatory agencies, and (iii) all the stakeholders and interest groups. EIA integrates the environmental concerns of the steel project right at the time of initiation of the steel project. Because of this, it enables the integration of environmental concerns and mitigation measures with the development of the steel project. Thus, EIA thus prevents future liabilities or expensive alterations in project design. EIA starts with the scoping which is a process of detailing the terms of reference of EIA. It has to be done by the consultant in consultation with the project authorities. If required, guidance can be taken from the impact assessment agency. For the purpose of EIA studies, it is necessary that the quantifiable impacts are assessed on the basis of magnitude, prevalence, frequency and duration, while for the non-quantifiable impacts, significance is generally determined through the socio-economic criteria. Baseline data for the EIA describes the existing environmental status of the identified study area. The site-specific primary data need to be monitored for the identified parameters and supplemented by secondary data if available. Impact prediction is a way of mapping the environmental consequences of the significant aspects of the project and its alternatives. Since the environmental impact cannot be predicted with absolute certainty, hence, it is necessary that all the possible factors are considered and all the possible precautions for reducing the degree of uncertainty are taken. The following impacts of the steel project are assessed during the EIA studies. Air – Assessment includes changes in ambient levels and ground level concentrations due to total emissions from point, line and area sources. The effect on soils, materials, vegetation, and human health is also assessed. Noise – Assessment includes changes in ambient levels due to noise generated from equipment and movement of vehicles. The effect on fauna and human health is also assessed. Water – Assessment includes (i) availability to competing users, (ii) changes in quality, (iii) sediment transport, and (iv) ingress of saline water. Land – Assessment includes (i) changes in land use and drainage pattern, (ii) changes in land quality including effects of waste disposal, and (iii) changes in shoreline/riverbank and their stability. Biological – Assessment includes (i) deforestation/tree-cutting and shrinkage of animal habitat, (ii) impact on fauna and flora (including aquatic species if any) due to contaminants/pollutants, (iii) impact on rare and endangered species, endemic species, and migratory path/route of animals, and (iv) impact on breeding and nesting grounds. Socio-economic – Assessment includes (i) impact on the local community including demographic changes, (ii) impact on economic status, (iii) impact on human health, and (iv) impact of increased traffic. For EIA of a steel project, it is normal to identify the possible alternatives and compare the environmental attributes. Alternatives are to cover both (i) project location, and (ii) process technologies. Alternatives are also to include a situation with no steel project coming at the location. Environmental attributes of the alternatives are then be ranked in the EIA report in order to select the best environmental option for optimum economic benefits to the community at large. Once alternatives have been reviewed, a mitigation plan is then drawn up for the selected option and is supplemented with an EMP to guide the project authorities towards environmental improvements. The EMP is a crucial input to monitoring the clearance conditions for the project and hence details of monitoring are included in the EMP report. The EIA report normally provides clear information on the different environmental scenarios without the project, with the project and with project alternatives. Uncertainties are clearly reflected in the EIA report. Regulatory requirements need that the public around the steel project location is informed and consulted on the proposed steel project after the completion of EIA studies. Any one likely to be affected by the proposed project is entitled to have access to the ‘executive summary’ of the EIA report. The affected people normally may include (i) bonafide local residents, (ii) local associations, (iii) environmental groups active in the area and (iv) any other person located at the project site / sites of displacement. The people are usually given an opportunity to make oral/written suggestions to the regulatory authorities regarding the environmental aspects of the project. There are normally two types of EIA studies. These are (i) comprehensive EIA studies and (ii) rapid EIA studies. The difference between the two studies is in the time-scale of the data used. Rapid EIA is for speedier appraisal process. While both types of EIA studies require inclusion/ coverage of all significant environmental impacts and their mitigation, rapid EIA achieves this through the collection of one season (other than the rainy season) data only to reduce the time required. This is usually acceptable to the regulatory authorities in case it does not compromise on the quality of decision-making. The review of rapid EIA report by the regulatory authorities normally show whether a comprehensive EIA studies are needed or not. However, a professionally prepared comprehensive EIA report is a better approach for the steel project. Depending on nature, location and scale of the project, the EIA report generally contains all or some of the following components. Air environment – Under this included are (i) determination of impact zone (through a screening model) and developing a monitoring network, (ii) monitoring of the existing status of ambient air quality within the impacted region (usually 7 km to 10 km from the periphery) of the proposed steel project location, (iii) monitoring of the site-specific meteorological data such as wind speed and direction, humidity, ambient temperature and environmental lapse rate etc., (iv) estimation of quantities of air emissions including fugitive emissions from the proposed steel project, (v) identification, quantification and evaluation of other potential emissions (including those of vehicular traffic) within the impact zone and estimation of cumulative of all the emissions/impacts, (vi) prediction of changes in the ambient air quality due to point, line and areas source emissions through appropriate air quality models, (vii) evaluation of the adequacy of the proposed pollution control devices to meet gaseous emission and ambient air quality standards, and (viii) description of the mitigation measures at source, path ways and receptor. Noise environment – Under this included are (i) monitoring the present status of noise levels within the impact zone, and prediction of future noise levels resulting from the proposed project and related activities including increase in vehicular movement, (ii) identification of impacts due to any anticipated rise in noise levels on the surrounding environment, and (iii) recommendations on mitigation measures for noise pollution. Water environment – Under this included are (i) study of existing ground and surface water resources with respect to quantity and quality within the impact zone of the proposed steel project, (ii) prediction of impacts on water resources due to the proposed water use/pumping on account of the steel project, (iii) quantification and characterization of waste water including toxic organic, from the proposed activity, (iv) evaluation of the proposed pollution prevention and wastewater treatment system and suggestions on modification, if required, (v) prediction of impacts of effluent discharge on the quality of the receiving water body using appropriate mathematical/simulation models, and (vi) assessment of the feasibility of water recycling and reuse and delineation of detailed plan in this regard. Biological environment – Under this included are (i) survey of flora and fauna clearly delineating season and duration, (ii) assessment of flora and fauna present within the impact zone of the project, (iii) assessment of potential damage to terrestrial and aquatic flora and fauna due to the discharge of effluents and gaseous emissions from the steel project, (iv) assessment of damage to terrestrial flora and fauna due to air pollution, and land use and landscape changes, (v) assessment of damage to aquatic and marine flora and fauna due to physical disturbances and alterations, (vi) prediction of biological stresses within the impact zone of the proposed project, and (vii) description of mitigation measures to prevent and / or reduce the damage. Land environment – Under this included are (i) studies on soil characteristics, existing land use and topography, landscape and drainage patterns within the impact zone, (ii) estimation of impacts of project on land use, landscape, topography, drainage and hydrology, (iii) identification of potential utility of treated effluent in land application and subsequent impacts, and (iv) estimation and characterization of solid wastes and description of management options for minimization of waste and environmentally compatible disposal. Socio?economic and health environment – Under this included are (i) collection of demographic and related socio-economic data, (ii) collection of epidemiological data, including studies on prominent endemic diseases (such as fluorosis, malaria, filariasis, and malnutrition etc.) and sickness rates among the population within the impact zone, (iii) projection of anticipated changes in the socio-economic and health due to the steel project and related activities including traffic congestion and description of measures to minimize adverse impacts, (iv) assessment of impact on significant historical, cultural and archaeological sites/places in the area, (v) assessment of economic benefits arising out of the project, and assessment of rehabilitation requirements with special emphasis on scheduled areas, if any. Risk assessment – Under this included are (i) hazard identification taking recourse to hazard indices, inventory analysis, dam break probability, and natural hazard probability etc., (ii) maximum credible accident (MCA) analysis to identify potential hazardous scenarios, (iii) consequence analysis of failures and accidents resulting in fire, explosion, hazardous releases, and dam breaks etc., (iv) hazard and operability (HAZOP) studies, (v) assessment of risk on the basis of the above evaluations, and (vi) preparation of an onsite and offsite (steel project affected area) disaster management plan. Environment management plan – Under this included are (i) description of mitigation measures including prevention and control for each environmental component and rehabilitation and resettlement plan, (ii) description of monitoring scheme for compliance of conditions and (ii) description of implementation plan including scheduling and resource allocation. EMP describes how an action might impact on the natural environment in which it occurs and set out clear commitments from the people taking the action on how those impacts are avoided, minimized and managed so that they are environmentally acceptable. An EMP is normally prepared as part of EIA reporting. It translates recommended mitigation and monitoring measures into specific actions which are carried out by the project authorities. The EMP is required to be adjusted to the terms and conditions specified in the project approval. It is then form the basis for the impact management during the construction and operation of the steel project. Preparation of EMP report is required for formulation, implementation and monitoring of environmental protection measures during and after commissioning of the steel project. The EMP is to indicate the details as to how various measures have been or are proposed to be taken including cost components as may be needed. Cost of measures for environmental safeguards is to be treated as an integral component of the project cost and environmental aspects are to be taken into account at various phases of the steel project which include (i) conceptualization phase when preliminary environmental assessment is done, (ii) planning phase when detailed studies of environmental impacts and design of safeguards are carried out, (iii) project execution phase when environmental protection and safety measures are implemented, and (iv) project operational phase when monitoring of the effectiveness of built-in safeguards is carried out. The main components of an EMP generally include (i) summary of the potential impacts of the proposal, (ii) description of the recommended mitigation measures, (iii) statement of their compliance with relevant standards, (iv) allocation of resources and responsibilities for plan implementation, (v) schedule of the actions to be taken, (vi) programme for surveillance, monitoring and auditing, and (vii) contingency plan when impacts are greater than expected. EMP contains commitments which are binding on the project authorities. It is used to establish environmental performance standards and requirements during the engineering of the steel project. It is also generally used to prepare an environmental management system (EMS) for the operational phase of the steel project. Key principles for the preparation of EMP includes (i) it is to be balanced, objective and concise, (ii) it is to state any limitations which apply, or should apply, to the use of the information in the EMP, (iii) it is to identify any matter in relation to which there is a significant lack of relevant information or a significant degree of uncertainty, (iv) it is to include adaptive management strategies for managing uncertainty, (v) it is written in a way that is easily understood, (vi) it clearly present how conclusions about risks have been reached, and (vii) it ensures that the people taking the action take complete responsibility for the content and commitments contained in the plan. The important components of the EMP are given in Tab 1. 1 Summary of impacts The predicted adverse environmental and social impacts for which mitigation is required are to be identified and briefly summarized. Cross referencing to the EIA part of the report is desired. 2 Description of mitigation measures Each mitigation measure is to be briefly described with reference to the impact to which it relates and the conditions under which it is required. These are to be accompanied by, or referenced to, project design and operating procedures which elaborate on the technical aspects of implementing the various measures. 3 Description of monitoring programme The monitoring program is to clearly indicate the linkages between impacts identified in the EIA report, measurement indicators, detection limits, and definition of thresholds which signals the need for corrective actions. 4 Institutional arrangements Responsibilities for mitigation and monitoring are to be clearly defined, including arrangements for co-ordination between the various people responsible for mitigation. 5 Implementation schedule and reporting procedures The timing, frequency and duration of mitigation measures are to be specified in an implementation schedule, showing links with overall project implementation. Procedures to provide information on the progress and results of mitigation and monitoring measures are also to be clearly specified. 6 Cost estimates and sources of funds These are to be specified for both the initial investment and recurring expenses for implementing all measures contained in the EMP, integrated into the total project costs. The EMP is to be essentially based on considerations of resource conservation and pollution reduction. Some of the environmental issues covered in the EMP are (i) liquid effluents, (ii) air pollution, (iii) solid wastes, (iv) noise and vibration, (v) occupational safety and health, (vi) prevention, maintenance and operation of environment control systems, (vii) house-keeping, (viii) human settlements, (ix) transport systems, (x) recovery – reuse of waste products, (xi) green cover, (xii) disaster management planning, and (xiii) environment management cell. These issues are described below. Liquid effluents – Liquid effluents from the proposed steel project is to be treated as per the standards set by the regulatory authorities. Soil permeability studies need to be carried out prior to effluents being discharged into holding tanks or impoundments and steps taken to prevent percolation and ground water contamination. Also, special precautions are required to be taken regarding flight patterns of birds in the area since effluents containing toxic compounds, oil and grease can cause extensive death of migratory birds. Location of plants is also to be barred in such type of sensitive areas. Deep well burial of toxic effluents is not to be resorted to as it can result in re-surfacing and ground water contamination. Re-surfacing has been known to cause extensive damage to crop and live stocks. In all such cases, efforts are to be made for re-use of water and its conservation. Air pollution – The emission levels of pollutants from the different stacks are to conform to the standards set by the regulatory authorities. Adequate control equipments are to be installed for minimizing the emission of pollutants from the different stacks. In-plant control measures are to be taken to contain the fugitive emissions. Infrastructural facilities are to be provided for monitoring the stack emissions and measuring the ambient air quality including micro-meteorological data (wherever required) in the area. Proper stack heights as per the requirements set by the regulatory authorities are to be provided for better dispersion of pollutants over a wider area to minimize the effect of pollution. Community buildings and townships are to be built up-wind of the steel plant with one-half to one kilometer of greenbelt which is provided in addition to physiographical barrier. Solid wastes – The site for waste disposal is to be checked to verify permeability so that no contaminants percolate into the ground water or river/lake. Waste disposal areas are to be planned down-wind of villages and townships. Reactive materials are to be disposed of by immobilizing the reactive materials with suitable additives. The pattern of filling disposal site is required to be planned to create better landscape and be approved by appropriate agency and the appropriately pretreated solid wastes are to be disposed according to the approved plan. Intensive programs of tree plantation on disposal areas need to be undertaken. Noise and vibration – Adequate measures are to be taken for control of noise and vibrations in the steel plant. Occupational safety and health – Required precautionary measures for adopting OS&H standards are required to be taken. Prevention, maintenance and operation of environment control systems – Adequate safety precautions are required to be taken during preventive maintenance and shut down of the control systems. A system of inter-locking with the production equipment is to be implemented where highly toxic compounds are involved. House-keeping – Proper house-keeping and cleanliness is required to be maintained both inside and outside of the steel plant. Human settlements – Residential societies are to be located away from the solid and liquid waste dumping areas. Meteorological and environmental conditions are to be studied properly before selecting the site for residential areas in order to avoid air pollution problems. People who are displaced or have lost agricultural lands as a result of locating the steel plant in the area need to be suitably rehabilitated. Transport systems – Suitable parking places are to be provided for the trucks and other vehicles by the steel plant to avoid any congestion or blocking of roads. Steel plant is to be located away from the highways in order to reduce road accidents because of substantial increase in the movements of heavy vehicles. Spillage of chemicals/substances on roads inside the plant may lead to accidents. Proper road safety signs both inside and outside the plant are to be displayed for avoiding road accidents. Recovery, re-use and recycle of waste products – Efforts need to be made to recycle or recover the waste materials to the extent possible. The treated liquid effluents can be conveniently and safely used for gardening in the plant. Green cover – Steel project is to have green cover within its boundary. This can be done by planting tree. Percentage of area coming under green cover is as per norms fixed by regulatory authorities. Disaster management planning – Adequate disaster management planning is required to be done in steel project to meet any emergency situation arising due to fire, explosion, and sudden leakage of gas etc. Fire-fighting equipment and other safety appliances are to be kept ready for use during disaster/emergency situation including natural calamities like earthquake/flood. Environment management department – The organization structure of the steel plant need to have an environment management department. The employees of this department are to be well trained in the environmental aspects connected with the various processes of the steel plant, and environmental regulations connected with steel industry. The responsibilities of this department are also to include the monitoring of the environment.